The Stratford Festival’s latest production of Hamlet, its first since 2008, has the effect of someone telling a story by rote without knowing what the story is supposed to mean. The Hamlet, Jonathan Goad, provides no throughline for the character and the director Antoni Cimolino, provides no throughline for the play. It can happen at Stratford and at the Shaw Festival, where certain popular plays are staged too frequently, that plays are staged simply because the festival feels it is time to stage them again, not because a director has a particular insight to share or because an actor has appeared who is perfect for a certain role. Thus it is with the current Hamlet. Judging from the set and costume designs of Teresa Przybylski, Cimolino seems to have had two concepts in mind for the play – one that it is about death, two that it is still relevant. Were Cimolino writing a student essay about the play, a teacher would point out that both topics are too general and need to be made more specific to analyze the text in a useful manner. Cimolino has not covered over the original floor and stage openings of the Festival stage. Przybylski’s set consists of a series of varied sizes of polished black marble slabs. The smallest look like tombstones; the largest look like part of a war memorial. When the graveyard scene arrives, this series of slabs finally look at home and make us realize that Cimolino and Przybylski have conceived of the entire action as taking place in a cemetery. To reinforce this idea, the final light we see is a bright beam that shines forth from what had been used as Ophelia’s grave. Before the action begins, Cimolino has troops clad in soldiers’ gear from World War I cross the stage. When we next see Fortinbras (John Kirkpatrick), he is clad in an soldier’s outfit from World War II. When Fortinbras appears at the end, he and his men are dressed as 21st century soldiers. In his “Director’s Notes”, Cimolino explains that the birth of the modern age was the Great War, “But since the story’s relevance defies limitation to one era, … the world begins to look more and more like our own”. Though this is true of the soldiers, it is not wholly true of the other actors. Only Gertrude’s and Hamlet’s garments change. Hamlet begins in a medieval tunic, leggings and boots but ends in modern black bomber jacket. Gertrude’s hemline does rise from her ankles to just below the knees and her hairstyle changes from piled up curls to short and straight. Otherwise, actors are clad in a costumes from a variety of periods giving no particular insight into their characters. Claudius (Geraint Wyn Davies) wears a modern business suit or modern military dress uniform. Horatio, Rosencrantz (Sanjay Talwar) and Guildenstern (Steve Ross) remain in Edwardian frock coats throughout. 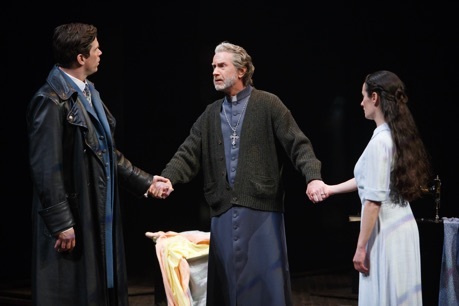 Most oddly of all, Polonius (Tom Rooney) is dressed as a pastor with a dusty blue cassock, dog-collar and cross. Since he has two children, we have to assume he is protestant. The garments of Laertes (Mike Shara) and Ophelia (Adrienne Gould) hark back to the mid 19th century. Though the multi-period costumes are meant to suggest the play’s eternal relevance, their actual effect is chaotic since, despite the show of Danish flags in the first court scene, the action seems to be set in no particular time and place and loses its substance being so untethered. To say, as Cimolino does, that “In Hamlet, as in our own lives, death is never far away” is too vague. The same could be said of any tragedy and even of some comedies. Without a specific take on the play, the actors, especially Goad, are left to their own devices as to how to play their roles. Goad is certainly the cheeriest and most energetic Hamlet I’ve seen and only suggests in fits a young man who has succumbed to melancholy or lost all his mirth. If Hamlet happens to mention any animal, say a crab, Goad imitates its movement, sound or both. It is clear from Goad’s performance that he regards certain passages of the play as significant and others as less significant. In the first category are all of Hamlet’s monologues and a handful of his prose passages such as “What a piece of work is a man!” For these passages Goad slows from his normally rapid pace of delivery to focus on the language and on making the meaning clear. 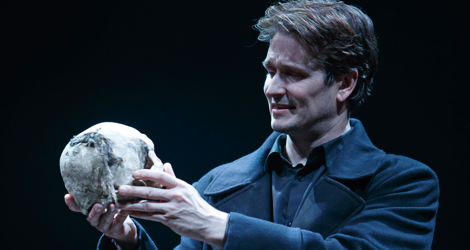 In this he is quite successful, though “To be or not to be” still comes out as a muddle. The problem, of course, is that little in what Hamlet says is “less significant”. The prose passage just before the duel (“We defy augury etc.) is significant but unfortunately Goad has not marked it as such and rushes through what many view as his final key insight. If Goad did not simply switch his melancholy on and off and if he were he to maintain clarity through the passages he seems to regard as less significant, he might be able to give us some idea of the emotional and intellectual journey Hamlet travels. As it is, the emotions of one moment never carry into the next, and intensity of feeling he expresses by shouting. The Claudius of Geraint Wyn Davies is just the opposite and is the best performance of the evening. Even in the midst of pomp, Wyn Davies suggest that Claudius is wary and insecure as if fearful from the start that his crime will be found out. When it is clear that Hamlet’s “madness” is not caused by love for Ophelia, Wyn Davies shows that Claudius’ anxiety increases. When he finds he cannot pray, he shows us how easily Claudius slides into the overt role of villain that he had earlier been trying to conceal. Seana McKenna offers up an intelligent Gertrude up to the bed chamber scene. After that, things go awry. Whether it is her own idea or Cimolino’s, McKenna’s Gertrude begins to go mad after seeing Ophelia go mad, as if madness were somehow contagious. McKenna’s Gertrude starts becoming unhinged during her recital of Ophelia’s death (“There is a willow grows aslant a brook”) as if the facts were too much to bear. By the final scene she drinks to Hamlet’s health with the poisoned chalice after tottering about the stage appearing either drunk or insane. Tom Rooney’s gives us a problematic Polonius. If he is a protestant minister, whose minister is he? When the court characters gather in the chapel, Gertrude crosses herself, but the others do not. So is Gertrude a Catholic and Claudius is not? Does that mean that Hamlet’s father who is in Purgatory, a place nonexistent in the protestant afterlife, was also a Catholic. And, if so why are they having Hamlet study at Wittenberg, the centre of the Protestant Reformation. allows Goad’s Hamlet to do this too when he refers to the audience of a play and makes a gesture to us who are seated in the theatre. It gets a laugh but it means that certain serious conversations also get a laugh. In the closet scene Polonius death got a laugh as did Hamlet’s line that he will “lug the guts into the neighbour room”. In contrast, Mike Shara gives a fine account of Laertes by suppressing his natural instincts for comedy and channelling the energy he would use for that purpose into depicting Laertes’ hotheadedness. Adrienne Gould is excellent in portraying Ophelia’s mental fragility supported, seemingly, only by Hamlet’s and her father’s love, so that we see clearly how the “nunnery” scene followed by Polonius’ death could easily push her over the edge. In her first mad scene, Cimolino has Ophelia enter wearing Polonius old cassock, an idea others have used such as John Caird in his Hamlet for the National Theatre in 2000. Among other performances are Tim Campbell’s earnest but rather bland Horatio, Juan Chioran’s powerful Player King, John Kirkpatrick’s strong-willed Fortinbras, Robert King’s dry-humoured Gravedigger and Mike Nadajewski’s dandified Osric. There are probably few people who attend theatre simply for the sake of the lighting, but Michael Walton’s lighting is truly remarkable. Except for the bright-lit court scene near the start of the action, Walton plunges most of the action in darkness illuminated in highly imaginative ways. Low lights cause actors to cast tall shadows against the back wall. Backlighting places actors in silhouette. Lights shone on black marble reflect characters on stage as if they were effigies on tombstones. Often the murk is slashed by shafts of light that only emphasize the darkness in which the characters fumble. It is no exaggeration to say that Walton’s lighting says more about themes of earthly transience, fate and the limits of man’s ability to reason than any part of Cimolino’s direction or Goad’s performance. An uninterpreted play tediously amounts to what Hamlet says he reads – “words, words, words”. 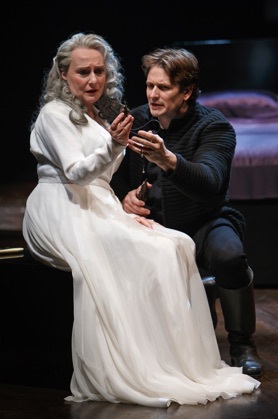 Photos: (from top) Jonathan Goad as Hamlet; Mike Shara as Laertes, Tom Rooney as Polonius and Adrienne Gould as Ophelia; Jonathan Goad as Hamlet and Seana McKenna as Gertrude. ©2015 David Hou.